For at least the past six years now online apologetics and discernment ministries like Apprising Ministries, have warning about the growing infestation within evangelicalism of critical thinking skills-numbing corrupt Contemplative Spirituality/Mysticism (CSM), such as that taught by Living Spiritual Teacher and Quaker mystic Richard Foster along with his spiritual twin and Southern Baptist minister Dallas Willard. You may recall that none other than Living Spiritual Teacher and Emergent Church guru Brian McLaren told you they were “key mentors” of the Emerging Church. So what did you think these mentors were teaching the leaders within the sinfully ecumenical neo-liberal cult of the Emergent Church, who have now gone on to develop a quasi-universalism in their new postmodern version of Progressive Christian theology under their spiritual circus “big tent” Emergence Christianity? Here’s the heart of the matter: This refried Roman Catholic CSM, because it’s centered on the self (cf. 2 Timothy 3:2) this corrupt Counter Reformation always leads those who practice it into ecumenicism—and even syncretism—which is crystal clear from observing what it did to the now mortally wounded mainline denominations. What’s so tragic is because spiritually spineless evanjellyfish embraced the EC, it is now also on the same broad road as the mainline. As an example of how CSM leads to syncretism consider Doug Pagitt Excited About Interfaith Powwows At Solomon’s Porch and Samir Selmanovic Defends Worshipping With Witches; it’s deeper into mainstream evangelicalism than you may even know as evidenced by The Daniel Plan of Purpose Driven Pope Rick Warren because The Daniel Plan Of Rick Warren Encourages Unbiblical Meditation. But could all of this really lead to a blending of Christianity and Islam; i.e. Chrislam. The gathering [was] a direct response to a letter signed by 138 Muslim leaders last fall that called for peace between Muslims and Christians for the sake of world peace. The letter, entitled “A Common Word Between Us and You,” urged followers of the two faiths to find “common ground” in the love of God and engage in more sincere discussions on peace rather than simply just “polite ecumenical dialogue” between certain religious leaders. 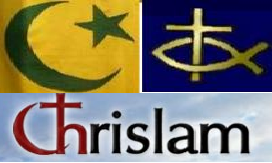 A Protestant renewal organization is concerned about the recent efforts of some mainline Protestant churches to produce an ecumenical reconciliation between Christianity and Islam. According to a recent blog post from The Last Crusade, congregations in several metropolitan areas — Houston, Atlanta, Seattle, and Detroit — preached sermons and held Sunday school lessons recently on the founder of Islam, Mohammad, whom Muslims consider a prophet. is an attempt to syncretize Christianity with Islam. While it began in Nigeria in the 1980s, Chrislamic ideas have spread throughout much of the world. The essential concept of Chrislam is that Christianity and Islam are compatible, that one can be a Christian and a Muslim at the same time. Chrislam is not an actual religion of its own, but rather is a blurring of the differences and distinctions between Christianity and Islam. Well, how convenient; why didn’t the Apostles think of that, might have saved them from being murdered. And how’d that blending of religious practices work out for Israel in the Old Testament? Not well; and yet spurious CSM is the bridge connecting the professing Christian with the professing Muslim. This is corroborated by Tony Campolo, who’s one of those Red Letter Christians together with other apostates like the aforementioned Brian McLaren, as well as another third of the unholy trinity of the EC, progressive theologian Tony Jones—who’s the heretical “theologian in residence” at the gathering place of his equally heretical universalist pastor Doug Pagitt. a theology of mysticism provides some hope for common ground between Christianity and Islam. Both religions have within their histories examples of ecstatic union with God, which seem at odds with their own spiritual traditions but have much in common with each other. I do not know what to make of the Muslim mystics, especially those who have come to be known as the Sufis. What do they experience in their mystical experience? Could they have encountered the same God we do in our Christian mysticism? Notice the double-speak as first Campolo tells us that Islam and Christianity both have “examples of ecstatic union with God”; then he muses, “Could they have encountered the same God we do in our Christian mysticism?” Campolo certainly hopes so; as this would help him win friends and influence people within Islam, and would then neatly by-pass that nasty exclusive message of Scripture e.g. — Anyone who does not have the Spirit of Christ does not belong to him (Romans 8:9). Yeah, that’s just gonna get in the way of this whole Chrislam thing; so we’ll ignore it because we feel that faithful Muslims, who’re doing “good” in the area of global social reform, must be following God in the way of Jesus. 1) For the Christian there can be no interfaith relations with any idolators worshipping a false god (cf. 2 Corinthians 6:14-18) because 2) we are ambassadors for Christ as we implore those in captivity to these false religious systems on behalf of Christ, be reconciled to God (2 Corinthians 5:20). As one who’s been in the ministry field of Comparative Religion for almost 24 years I can tell you categorically that Islam most certainly does not follow “the teachings of Jesus too.” In fact, it denies in no uncertain terms Who He is; the one true and living God in human flesh. No genuine Christian will throw their arms around that. Islam claims to be fully surrendered to the will of Allah. And the will of Allah,Muslims believe, was revealed through his prophet Mohammed. The revelation is written down in the Muslim holy book, the Koran… Muslims believe that Allah alone is the one true deity. He has neither mother nor father; similarly, he has no sons or daughters. He is not a Trinity; he is not the God of the Old Testament; and he is not the God of Christianity. Allah, according to Islam, is the god of all humanity. Muslims believe in all the “Messengers and Prophets of Allah.” According to Islamic literature, Allah sent thousands of prophets (Jesus being one), but Mohammed is the greatest of them all… Islam is fundamentally and irreconcilably opposed to biblical Christianity. Islam teaches that Jesus Christ was a mere man–a prophet, and not God incarnate. Islam also denies that Jesus died on a cross. Obviously, if Christ did not die on the cross, He did not have to rise from the dead; so Islam denies the resurrection, too. Tony Campolo, Speaking My Mind: The Radical Evangelical Prophet Tackles the Tough Issues Christians Are Afraid to Face [Nashville: Thomas Nelson, 2004], 149, 150, emphasis mine.